I thought I'd mention my top three loves right now. 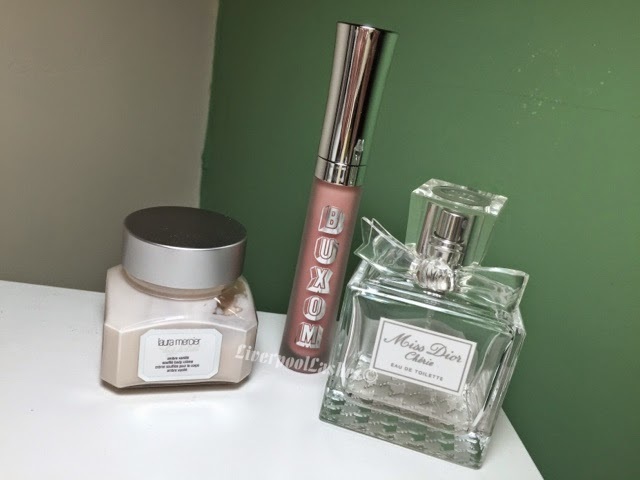 These three beauty products have me literally obsessed with them. First up is the Laura Mercier Body Soufflé in Amber Vanille. This is the little size that I got in their pâtisserie gift set however I do have the full size version now too which shows you how obsessed with it I am! Ultimately it's a luxury vanilla scent body cream that glides onto the skin, sinks in fast but the best part is that the fragrance lasts on my skin virtually the entire day - it's amazing! Lastly is the elegant fragrance of Miss Dior Cherie which I've had for a couple of years now. It's such a sophisticated scent that's not too sweet, not too child like but not too mature, it's absolutely gorgeous! I love the Laura Mercier Body Souffle cremes. My favourite is the Creme Brulee.